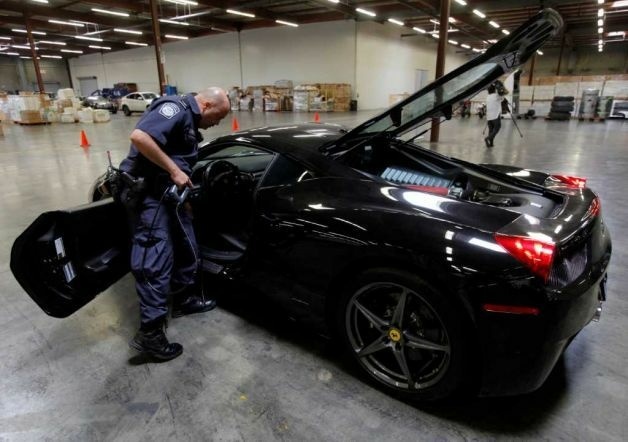 U.S. Customs and Border Protection officer Paulo Zanetti, right, checks the interior of gas tanks, next to a 2010 Ferrari 458 Italia "supercar." California Highway Patrol officers: Lt. Glenda Brents, left, and Sgt. Mike Stefanoff, check the vin number of an intercepted 2012 Lamborghini Aventador LP700-4 "supercar," that was being illegally exported with a lesser declared value, being held by U.S. Customs and Border Protection, next to other 20 high-end stolen vehicles that were intercepted on their way to Honk Kong and Vietnam, in Carson, Calif., on Tuesday, April 3, 2012. Federal agents in Los Angeles have seized $1.5 million worth of stolen, luxury vehicles bound for Asia, they announced Tuesday. U.S. Customs and Border Protection at the ports of Los Angeles and Long Beach discovered the aqua-caravan of Ferraris, Mercedes and Audis after a Ferrari dealer tipped off agents in February, said Director of Field Operations Carlos Martel. Four of the 16 cars recovered in the operation were seized in Vietnam. The rest were seized when a ship was ordered to return to port last week just after departing. The hot wheels were found by officers in containers marked "used exercise equipment." The highlight of the repossession was a Ferrari 458 Italia valued at over $280,000. Martel says the investigation is in the early stages, and that no one has been arrested.